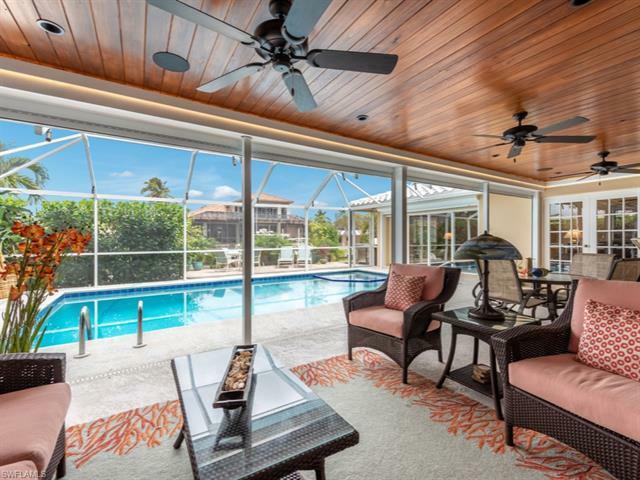 This extremely well maintained home is only five houses from Naples Bay, with easy no-bridge exit to the Gulf. The seawall was re-enforced in 2017 and new dock pilings and a 20, 000 lb boat lift were installed. Adjacent to the dock is a new pavered walkway, patio, and outdoor kitchen, with a 250 gallon gas tank installed underground to supply the grill. The screened pool enclosure, installed in 2017, with beautiful wood paneled lanai ceiling, fans, and speaker system allows the best of indoor/outdoor living. The roof, the A/C system and the duct work were all replaced in 2018. The electric storm shutters were replaced in 2014, a new refrigerator in 2019 and a new whole house water filtration system added in March of 2019. See the feature sheet for all the recent updates to this beautiful ranch home in one of the most sought after areas of Naples.